Der Servierlöffel eignet sich bestens für das Servieren von Gemüsegerichten, Aufläufen und klassischen Beilagen wie Reis und Kartoffeln. Er ist deutlich größer als das Menuebesteck, seine Laffe ist rund und großzügig, um Speisen leicht aufnehmen und servieren zu können. Zu jedem WMF Besteck gibt es den passenden Servierlöffel. Serving pieces belong on every table. Many dishes require special spoons or ladles so that they can be served elegantly. Our product range has the serving cutlery to meet your every need. Have you ever tried dishing out pasta with a ladle or getting lasagne onto a plate with a spoon? Usually, even in the best-case scenario, the results aren't pretty! That's why our product range includes a wide variety of serving pieces perfectly suited to special dishes. People who like even their regular meals to be stylish never serve their dishes in pots, but bring them to the table in matching serving bowls and on serving plates. For this you need the right serving pieces, which are not only visually impressive. They are also perfectly designed for their respective purpose. That applies to lasagne servers - which can also be used as a cake server - as much as to pasta tongs and sauce ladles. To serve meat such as sliced roasts, cutlets or steaks, we strongly recommend using our serving forks, which come as part of a practical set. These two-pronged forks can also be used to serve cheese or fish. Practical as they are, they also make useful kitchen tools for filleting meat in the kitchen prior to serving. WMF serving cutlery matches our collections, the designs of which range from simple to opulent. As with our cutlery sets, we use Cromargan®, Cromargan protect® or silver as stable raw materials. All items are dishwasher safe and come with either a polished or a matt surface. If you prefer a purer design for your cutlery, we recommend the polished Nuova collection. In addition to table cutlery and serving pieces, these and many of our other collections can be complemented with espresso spoons, latte macchiato spoons and cake forks. Fruit knives and sets of serving cutlery are also available in matching designs. As with all our collections, we place great store by functionality, timelessly beautiful design and durability, with products that can cope with regular use and being cleaned in the dishwasher without being damaged. Thanks to their high-quality materials, the entire WMF cutlery range is acid-resistant and naturally sturdy. You can't cook without spoons! WMF spoons complement your cutlery sets in extraordinary ways. A range of appealing designs combines with high-quality materials to guarantee you will enjoy your spoons for a long time to come. Spoons have been used for thousands of years, and were the first type of cutlery to be developed. They are designed with the shape of your hand in mind. The first spoons were made from wood or bone, whilst modern dinner spoons are made from high-quality materials, most commonly stainless steel. Of course, wooden spoons do still exist today, but they are largely used as cooking spoons or serving cutlery. A spoon always consists of two parts, a shaft and the bowl of the spoon. A dinner spoon has a flatter bowl than a soup spoon. You can choose your personal favourite from a wide range of WMF spoons, particularly with regards to the design of the shaft and the bowl. What all our dinner spoons have in common is a modern design combined with maximum functionality and an ergonomic feel. The normal spoon that forms a set along with knives and forks is known as a dinner spoon. This means you won't get it mixed up with teaspoons, serving spoons or cream spoons, which are much smaller. WMF offers you high-quality cutlery in the unique material Cromargan protect®. It has been internationally patented by WMF because of its high level of resistance to all kinds of wear and tear. As it is scratch resistant, your spoons will look as good as new even after years of use. Needless to say, Cromargan protect® is also rust-proof and dishwasher safe. Dinner spoons made from Cromargan® 18/10 stainless steel are ideal for households of all sizes. We also offer particularly high-quality dinner spoons in 925 sterling silver, a favoured option for special occasions. Make sure to amaze your dinner guests with quality spoons that fit the contours of their hands, making eating a smooth and sensual experience. Our WMF dinner spoons have a unique feel to them from the shaft to the bowl, turning every bite into a highlight. Look through our different cutlery series and find the ones that best fit your style – there's something for everyone in the WMF online shop! Serving spoons are an important part of every cutlery set. They make serving potatoes, vegetables, rice and many other side dishes extremely easy. On special occasions, most people like to welcome their guests with a decoratively laid table. Whether it is the plates, the glasses or the cutlery – you want everything to complement and match each other perfectly. Your serving pieces can even have the same pattern as all your other cutlery, because WMF has a model to match every cutlery collection. Although the serving spoon may at first glance look like a table spoon, it is different in a number of ways. The bowl is much more rounded than that of normal spoons and is also relatively shallow. This enables you to pick up food extremely easily without having to use an additional utensil to help you. Serving spoons also have a much longer handle, which makes serving at the table easier and ensures that the serving spoon does not slip down from the edge of the serving bowl or plate and end up in the sauce. On the whole it is bigger than a table spoon. It is better to use a serving spoon for serving solid foods. These include vegetables, rice, pasta and potatoes in particular. However, it is ideal for cutting and serving casseroles and gratins as well. The serving spoon is even superb for serving desserts. Its rounded shape allows you place mousses, sorbets, parfaits or small cakes on your plate perfectly. Our product range includes a serving spoon to match every WMF collection. These include classic models such as the Fächer serving spoon or timeless designs from collections such as Boston or Vision. Upgrade your existing cutlery set with matching serving cutlery and ensure that you can serve your dishes in true style. 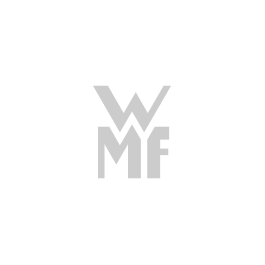 In the manufacturing process, WMF always uses either Cromargan® or Cromargan protect® stainless steel, two of WMF's patented materials, which are extremely durable, rust-proof and scratch-resistant. You can wash the WMF serving spoons in the dishwasher, making cleaning easier. Discover the WMF product range now and upgrade your personal cutlery set!